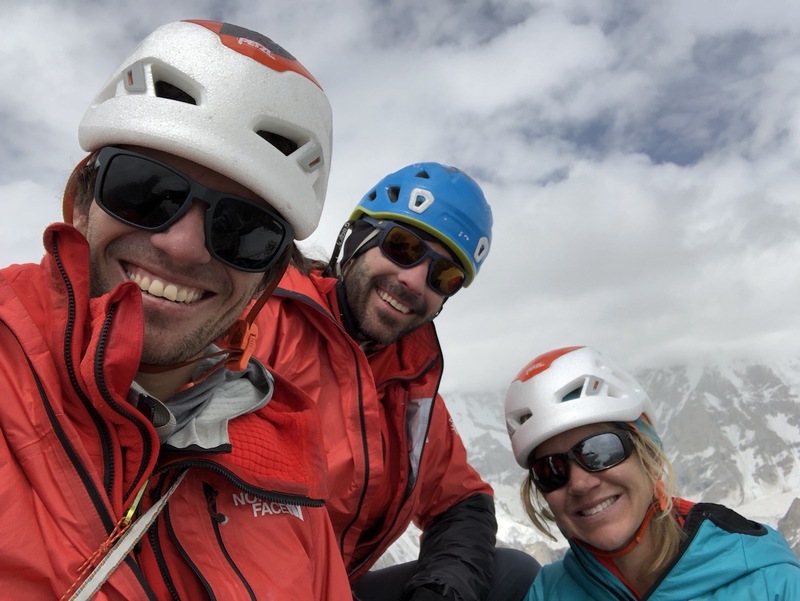 Andres Marin recently capped a successful trip to Pakistan with teammates Anna Pfaff and David Allfrey by soloing the American Route on Great Trango Tower (6286m)—base camp (ca. 4100m) to base camp in less than 12 hours—on August 22 after he had climbed that route and Eternal Flame on Nameless Tower (6239m) with his partners between August 12 and 18. In short, Marin tagged three summits over 6000 meters in the span of 10 days. "I had three days' rest [after the first two climbs], but my legs still felt to be on the heavy side...a storm was forecasted, so if I was going to try the solo it had to be then," said the 35-year-old guide who was born in Colombia and is now based in Ouray, Colorado. He has been training with Steve House in recent years. "I'm not a gifted athlete, so I have to keep up with training," Marin said. While Marin has ventured up to altitudes of around 6000 meters at least once a year since he first guided Denali in 2006, Allfrey, who is based in Las Vegas, Nevada, had never been above 14,500 feet (4400m) until this trip. "I found that it all felt OK until [we got] above 16,000 feet [4900m] and then it got tough until [we were] fully acclimated," Allfrey said. "Getting acclimated is a fairly slow process. I don't think I did poorly at altitude but I didn't feel exceptional by any means. When we finally came down, after doing both routes, I think that was when we all finally felt truly acclimated." Pfaff, who also has a fair amount of high-altitude experience and is based in Oakland, California, originally intended on climbing as part of an all-female team, but plans with partners failed to align. "The team came together due to our experience in our own specialties," Pfaff said. "Climbing-wise we were a really good team." Marin said the three of them did some climbing in Yosemite to get acquainted before the trip. They arrived in Islamabad on July 26 and the next day flew to Skardu, where they met Abdul Ghafoor, the owner of Higher Ground Expeditions. He became a central figure in their expedition, as he'd been on countless trips with Kyle Dempster, Scott Adamson and Hayden Kennedy. All three of those climbers had died in recent years and all were friends with Ghafoor, Allfrey, Marin and Pfaff. "Spending time with [Ghafoor] was a way of remembering them," said Marin. "He had so many cool stories." Ghafoor, Allfrey, Marin and Pfaff spent three days hiking from Askole into base camp at 4100 meters with 17 porters and a train of donkeys. 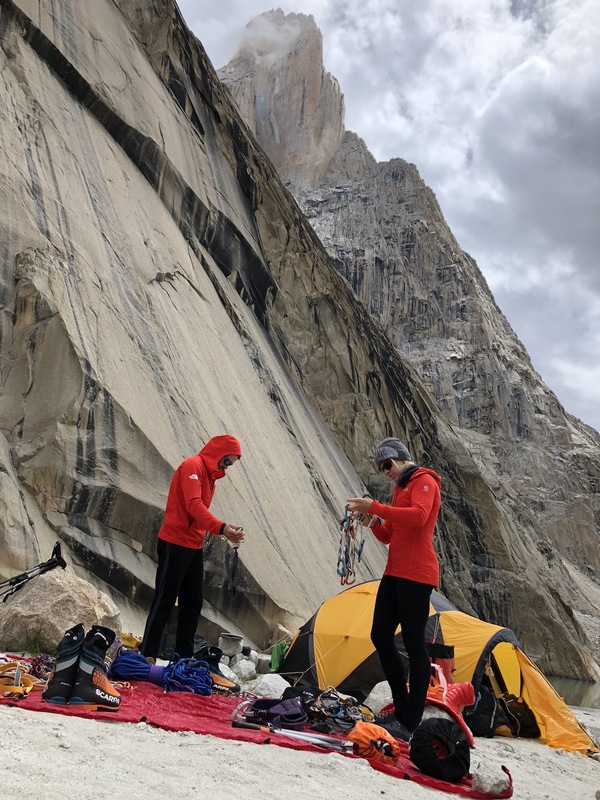 From camp, they had full views of the Trango Towers, Uli Biaho and countless other fascinating spires. 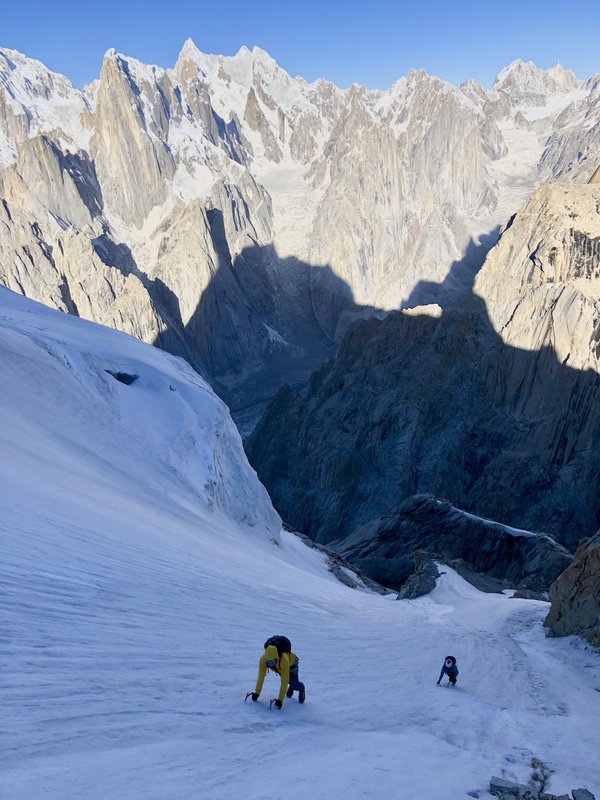 They immediately set to the task of acclimatizing on Great Trango Tower, making numerous rounds up a 1000-meter gully choked with cumbersome scree and boulders held tight by ice. Red Star Camp, at 5330 meters near the top of the gully, served as their advanced base camp for many nights throughout their trip. They spent one night there and dropped a cache before returning to base camp. Soon, they returned, intent on acclimating on the American Route on the northwest ridge of Great Trango Tower, which was established by Scott Woolums and Andy Selters in 1984, almost a decade after the heavily glaciated peak was first climbed by John Roskelley, Kim Schmitz, Galen Rowell, Dennis Hennek and Jim Morrissey in 1977. When Allfrey, Marin and Pfaff made their second trip up to Red Star Camp, Allfrey came down with stomach issues and descended to base camp. Pfaff and Marin moved another cache toward Nameless Tower on the opposite side of the col from the top of the gully and returned to base camp. All three returned to Red Star Camp on August 11, and awoke at 3 a.m. on August 12 to climb the American Route. They found rocky buttresses strewn with old fixed lines and often utilized them for the sake of speed. Eventually, the ridge joined a glacier that angled up to 60 degrees "with a lot of air behind [their] heels," said Marin. "[The summit] looks like the icing on top of a cake." They climbed as close to the summit cornices as they dared and descended back to Red Star Camp, reaching it nine and a half hours after leaving. Rockfall near the tent at Red Star Camp tested their nerves on August 13, as it would on several occasions throughout the trip. A snowstorm on August 14 forced a second rest day. On August 15, they launched on Eternal Flame on Nameless Tower. This spectacular route was established in 1989 by Kurt Albert, Wolfgang Gullich, Milan Sykora and Christoph Stiegler. Of the 35 difficult pitches on the route, 13 pitches contain climbing over 5.11. Albert gave the route a difficulty rating of 5.12c. Thomas and Alex Huber finally free climbed it in 2009 at 5.13a. From Red Star Camp, Marin lead a block of approximately nine pitches with difficulties up to 5.11 on the Slovakian route, which linked into the start of the Eternal Flame route. "[Allfrey and Pfaff] did a lot of work, jugging with huge packs," said Marin. By day's end, they joined Eternal Flame on a ledge called Sunny Terrace. "It was crazy, at times I was ice climbing while wearing rock shoes in an iced-up chimney, avoiding the ice with my feet by using rocks and the side of the walls," said Marin. At one point a dislodged block fell onto Pfaff; Marin swears his ice tool attached to her pack took the brunt of the force and almost certainly saved her life. "All of the sudden, I heard a rock flying down the wall. I dove behind the pack as best as I could and felt the impact from the other side," said Pfaff. "Andres's ice tool was bent. I had a good adrenaline rush after that!" On Sunny Terrace, they watched their lengthy forecast of stellar weather shrink significantly. With the headwall of Eternal Flame looming above, the team had a long discussion. "I'm not sure if we bailed from there if we'd have the psyche to do it all over again," Marin said. "After not summiting anything for several years, I was extremely hungry." 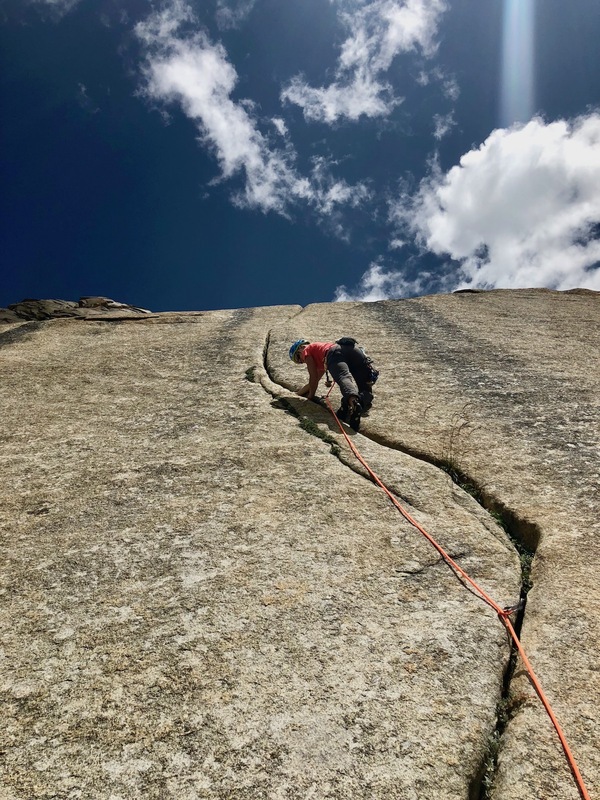 With the decision made to continue, Pfaff and Marin unleashed Allfrey, a Yosemite big wall climber with many El Capitan speed records to his credit. On the vertical and overhanging cracks, he utilized many special aid techniques including short fixing. "He was climbing as fast as he could," Marin said. "It was one of the coolest things I've witnessed in the mountains. He just charged uphill." Allfrey took the lead again on August 17, finally relinquishing it to Marin when the terrain changed from vertical granite to mixed ice, rock and snow. As weather approached from the southwest, Marin (with the team's only set of crampons and tools) linked several pitches and took the team to the summit of Nameless Tower. "For the longest time it seemed so huge and out of reach for me," said Pfaff, "but when we were on the summit, it was incredible. I've thought about climbing the Nameless Tower for 15 years." At least 30 rappels landed them back at Red Star Camp at dark. The next day, they descended to base camp. Marin wasn't through yet. On August 22 at 4 a.m., he strolled away from camp and made one final excursion up the imposing gully. "Sometimes I was listening to the mountain," he said. "Other times I was listening to Pantera or Rancid." As the sun rose in the east, Marin navigated up the Selters-Woolums route on Great Trango Tower. "That route is actually harder than you'd think," he said. Despite climbing it as part of a team earlier on the trip, he was unable to capitalize on old footprints. In fact, he found it icier than before, and the snow had frozen hard enough that he had to frontpoint in places where he'd previously been able to side-hill. Eleven hours and 28 minutes after leaving base camp, he returned, having stood alone on the summit. Numerous stuck rappels cost him at least an hour. "I remember being back before tea time, which is at 4 p.m.," Marin said. In a way, the speediness of his ascent echoed his start as a professional climber. Marin's climbing career began in 1999 when he was a teenager in Columbia. A friend suggested they climb the 5100-meter volcano that overlooked their hometown and the two got into rock climbing soon after. Marin moved to Colorado to be closer to family in the early 2000s, which also placed him in close proximity to the crack climbing of Indian Creek, Utah, and the high-end sport climbing of Rifle Mountain Park, Colorado. In 2006 he went to the Ouray Ice Climbing Festival where he tried ice climbing for the first time. Swinging tools came naturally to him—he won the amateur speed competition and earned his first sponsorship. He went on to represent the US in six ice climbing World Cups. 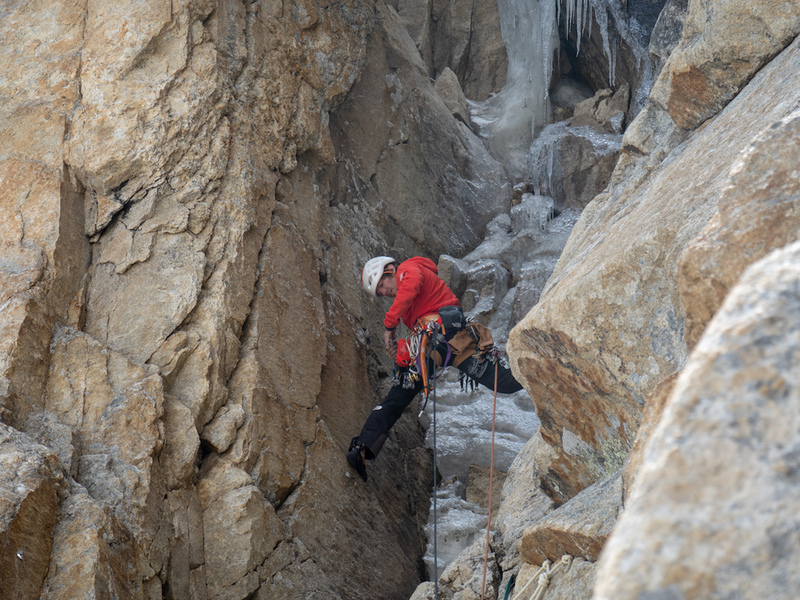 He is now one of the route setters for the Ouray Ice Fest, and has stood on the podium three more times for speed and difficulty events in 2011, 2014 and 2015. 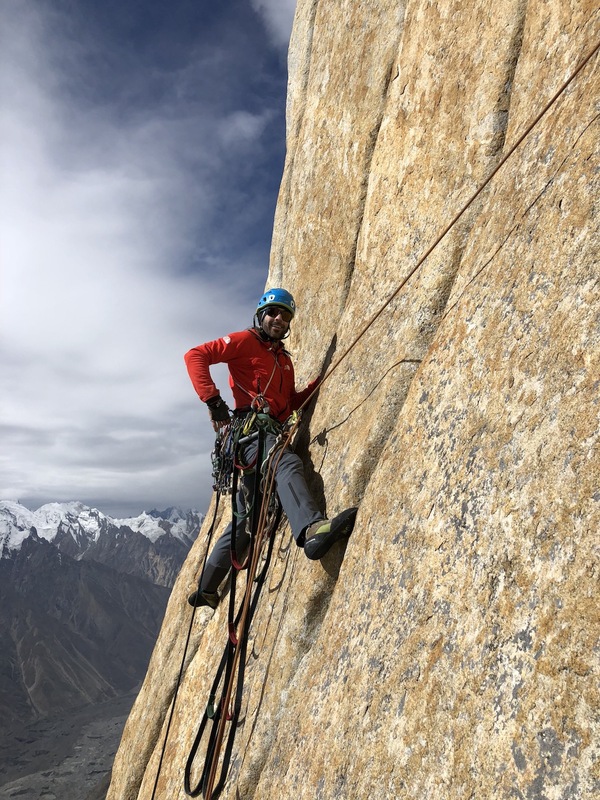 He said this Pakistan trip was his first expedition geared toward big-wall rock climbing and he credited Pfaff as the "mastermind" for getting them there. "The people here are amazing and non-judgmental, friendly and open," Pfaff said. "[They] want to get to know you. For me, Pakistan is about the mountains, the people and the experience of going way out there. It's a powerful place."